Posted November 8, 2017 by Josette Farrell in News. 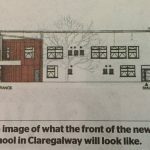 PLANS for two major school projects in Claregalway, which attracted a high number of public submissions, have got the go-ahead from Galway Co Council. 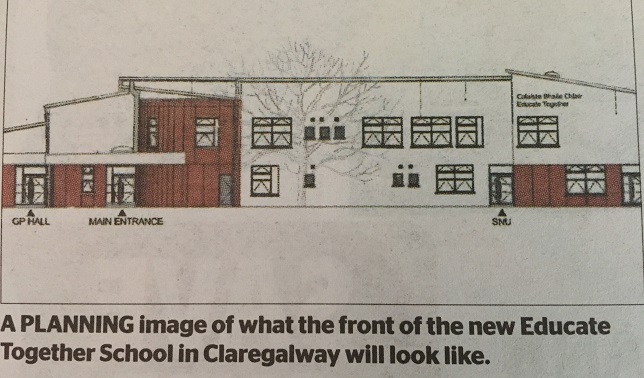 The Department of Education plans to build a substantial extension to the secondary school Coláiste Bhaile Chláir and construct a new home for Claregalway’s Education Together national school. (ETNS). The two projects will be co-located on the site of the existing Coláiste Bhaile Chláir. In September permission was granted for a six-room extension on to Claregalway NS on the Oranmore Road in the village. Claregalway ETNS opened in 2005 with 29 pupils enrolled. 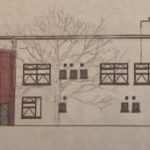 The new school is earmarked for a site adjoining Coláiste Bhaile Chláir and will be a 16 classroom two-storey building with a two-classroom special needs unit and GP hall. Permission has also been granted for the third phase of Coláiste Bhaile Chláir, run by Galway Roscommon Education Training Board (former VEC). The school first opened in 2013 with 168 students and now has some 800 students. 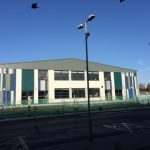 The latest phase will involve the construction of a two-storey extension to include a two-classroom special needs unit and a sports hall. However, many residents, who stressed they are supportive of both schools, aired their opposition to the location of the new primary school in submissions on the plans with Galway County Council. Planning permission has been granted subject to 14 conditions. Once of these includes that all signage relating to the proposed development shall be in Irish. A submission by Udaras na Gaeltachta had called for such a condition and planners say it is included in the interest of protecting the linguistic and cultural heritage of the area. While permission has been given by the local authority, this can be appealed to An Bord Pleanala. Given the level of submissions opposing the development, this is likely. Submissions from residents claimed their efforts to engage with the Department and planners have been ignored. The Department of Education declined the requests for a meeting with the community. The Department wrote to the association in January to say that a meeting wasn’t feasible. 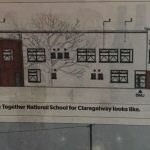 The Claregalway Community Development Association in their submission warned the Department that if the planned proposal went ahead the location of the new school would become a “protracted and divisive issue” and could involve “many forms of protest”.